When American soprano Christine Brewer cancelled her August 4 Toronto Summer Music Festival recital in late June, it put the management of TSMF in a tough spot - how do you replace an eminent, seasoned recitalist on such short notice? We had the answer last evening. Instead of a veteran with years of experience, Toronto audiences were introduced to not one, but two young singers of great promise: soprano Kiera Duffy and tenor Nicholas Phan. 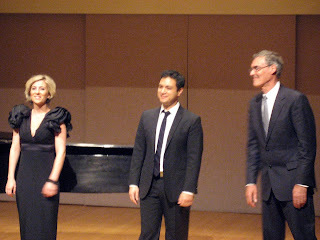 Pianist Roger Vignoles has previously worked with Duffy in a recording of Strauss songs, and it was on his recommendation that TSMF extended the invitation to Duffy, together with Phan, to appear at the Summer Festival. Met in HD audience may have caught Ms. Duffy as one of the finalists in The Audition, a documentary that chronicles the 2007 Metropolitan Opera Auditions. A high soprano with a well focused sound and an excellent technique, Duffy has since gone on to a fine career in opera and concert. Nicholas Phan possesses a sweet, lyric tenor combined with an engaging stage presence. He has sung opera in such diverse venues as Glyndebourne, Glimmerglass, Frankfurt, Chicago,and the Edinburgh Festival. He's also a noted recitalist, as a number of his song recitals can be found on Youtube. These singers are new to Canadian audiences, and the intimate Walter Hall is an ideal venue for a debut recital. The program opened with Mr. Phan singing Schumann's Liederkreis Op. 24, a cycle of nine songs set to the text of Heine. This is not the more familiar, 15-song Liederkreis Op. 39. Phan sang with exemplary enunciation of the text as well as plenty of expressive nuance. His is a beautiful compact-sized instrument, with genuine sweetness and a caressing tone quality. Perhaps it's youthful exuberance, Phan last evening tended to over-sing in the climactic moments, pushing his voice at the expense of steadiness - a few times it took on a worrisome pronounced vibrato. He needn't have tried to make a bigger sound as it carried very well in the small and acoustically lively Walter Hall. In the second half, his major contribution was Britten's Winter Words in a particularly affecting performance. It's a difficult cycle that taxes the singer and audience alike, but Phan made it come alive and sustained the audience's interest well. Perhaps because of the complicated and convoluted text, his English was hard to understand and one had to keep referring to the song text. The last song, "Before Life and After" was touching - Phan's depth of understanding of the material was impressive. Duffy's solo contribution in the first half was Poulenc's Fiancilles pour rire. Poulenc set this cycle of six bittersweet songs to the text of his good friend Louise de Vilmorin. Duffy sang the eclectic cycle with its many changes of mood well, although her high soprano meant some of the text was lost, and overall I would have liked more warmth in her delivery. Her stage presence appeared a bit cool and reserved for these songs - it would have been nice if she had engaged the audience more. In the second half, her centerpiece was the Brentano-Lieder - this went much better. Unlike the Poulenc, the Strauss cycle is ideally suited to a high voice along the lines of a Diana Damrau, and Duffy sang it with nice, focused tone and fine technical control, with many lovely high pianissimos. The two artists collaborated in several duos - three by Schumann, and Rossini's La serenata. "Tanzlied" was nicely done; "Die tausend Grussse" sounded suitably exuberant if a touch too competitive -and loud- between the two singers! Roger Vignoles is the elder statesman here, and he offered rock solid, sympathetic support to the soloists but rightly never receded into the background. All in all, it was an auspicious Canadian debut for the two soloists, and to be sure they will be heard from again in the future. The Orchestre symphonique de Longueuil conquered the stage with a powerful start. The performance was synchronized with the Loto-Quebec Fireworks, as conductor Marc David led the orchestra with irresistable zest. Spanish painter Jorge Colomina was once again present to document the performance. The concert was split into three parts: live orchestra with the fireworks; the orchestra and the group Répercussion, four talented percussionists; and a brilliant finale featuring Marie-Josée Lord. Répercussion demonstrated their range of instrumental talents; it was almost unbelievable. A pan flute quartet, an eight-hand marimba, djembe, singing—these musicians rocked percussion like none other. I met up with Marc David after the concert and spoke to him about the Festival and the concert. As a first-timer at the LIPF, the orchestra enjoyed a good-sized crowd and a warm welcome. The Orchestra celebrated its 25th anniversary this year, and the season-ending performance with the fireworks was perfect for the occasion. “The idea of bringing fireworks into the concert began when we were having conflicts between the fireworks themselves and the noise they would make while we would be performing. I thought, ‘Why don’t we take 30 minutes and synchronize the two together?’ So we got into contact with the La Ronde organizers and I received the recording that the Australian team would use for the fireworks. I then adapted the song into an orchestral piece that we could perform and, at the same time, follow the explosive visuals. I’m very proud of the results. “You can really feel the difference between an outdoor festival like this one and a concert hall. For summer concerts like these ones, we like to try to come out of our usual repertoire and format, and offer to the public something more fun, festive and light,” he said, with a twinkle in his eye. The great thing about Longueuil’s International Percussion Festival is the array of different activities offered: a drum workshop, a dance workshop, stalls selling goods, a mini-museum, restaurants right by the street, concerts, and dance shows. As I wandered up and down the street, I even came across a circus performance of aerial silks. Thursday featured a free performance by Bïa & Paulo Ramos with live painting by Brazilian painter Flavio Freitas. Brazil-born Montrealer Paulo Ramos and his band displayed a suaveness that captured the audience’s hearts straight away. The Latin rhythms made the crowd dance, clap and sway. There was even a dancer who blitzed across the stage with a flurry of quick-footed steps and taps—a true dancing Faust! I managed to catch a glimpse of UPPERCUT, a woman’s urban drumming group, before they left the Hôte Zone stage. Next up was a dance intensive workshop presented by Bahia Studio. Evens Plissint, salsa director at the Bahia Studio School, riled up the crowd for the “best 30 minutes of our lives.” With the Bahia S.W.A.T. team—a group of dancers dressed in a flashy blue t-shirts—in the crowd, Evens and Francis Lafrenière, two-time finalist of So You Think You Can Dance, coached us in a simply choreographed funk dance. All too soon, the workshop ended, but Evens promised to return on Saturday, this time at the Loto-Quebec stage with a fleet of dancers, shows and new choreographies. I arrived early at The Cuban Martinez Show and the crowd had already gathered around, itching to dance. When the show started, the audience exploded into action. The Cuban Martinez show has an impressive band that includes guitar, trombone, bass, drums, percussion, singers, keyboard and trumpet. This lively act churned out irresistible Cuban jazz fusion. If you mixed tap dancing, drums, a bass, a synth backtrack, and some vocal elements together, you would get Pec Percussion. Behind all this is Frédéric Gauld, a young man with a bright smile and a strong sense of rhythm. I met up with him after the concert. Maloukaï, a female drumming group, was founded in Montreal in 2005. Though many of its original members have left, the group still has eight members: Nancy Saviskas, Josée Mercier, Marise Demers, Nadia Essadiqi, Anne-Marie Kirouac, Isabelle Delaney, Sandra Laine and Christine Rouillard. They perform original material and original choreographies. In 2010 they won the Desjardins de la Relève contest for best musical group and were awarded a show on the Loto-Quebec stage this year. I spoke with Anne-Marie Kirouac about their performance. “It’s good to get new people to... discover what percussion instruments are and the music that they can produce. For example, about Maloukaï, some people might be thinking, ‘My gosh, an hour of music with only percussion? How could I possibly listen to that?’ and we try to show them that there are different things that we can do with percussion: shifting the rhythms, mixing the timbre, and creating new instruments with objects like garbage cans. And that, no, they won’t get bored listening to us. “We try our best to create musical pieces that are different from each other because we know that we don’t have a thousand instruments that we can use, so at some point there will be sounds that will be repetitive. So we always try to bring in new styles and I think we were able to do that today,” she says. This year marked the tenth anniversary of Longueuil’s International Percussion Festival. Its new stage, dubbed the “Hôte Zone,” hosted an array of brilliant artists and musicians, including performances by Arashi Daiko, Normand Brathwaite, Insolita and the Orchestre Symphonique de Longueuil. Every day of the festival was dedicated to a particular country: Thursday celebrated Brazil; Friday, Cuba; Saturday, Guadeloupe; and Sunday, Spain. Opening the festivities was Arashi Daiko, Quebec’s only taiko group. Founded in 1983 by the Japanese Canadian Cultural Centre of Montreal, Arashi Daiko currently has eight members: Mikio Owaki, Michio Hirai, Sandra Kadowaki, Steve Chan, Ryoko Itabashi, Yukari Hazama, Manon Desmarais and Jean-François Gravel. Wearing simple costumes and with drum sticks in hand, they charmed the audience with their drumming and choreography in a charismatic, high-energy performance. The performance astounded with captivating dance, hypnotizing flute and thundering rhythms. I met up with Arashi Daiko after the performance. “We’ve been invited guests at LIPF since its first edition,” Mikio tells me. After Arashi Daiko’s opening performance, the crowd greeted Normand Brathwaite and the many artists that would grace the stage in the following days. Martin Deschamps, Insolita, and Bïa, all gave a sneak peek of their performances to come. Amid a sky full of fireworks, rhythms and music filled the cool night air and captivated the cheering audience. It was a magical, memorable night. “I think we’ve really achieved this goal because there are more and more schools for percussion here in Quebec and the group Samajam was created two years after we were founded. Also, it used to be very focused on the djembe, but now we really see that the horizons have opened and we have all kinds of different styles like gumboots, genres we have never seen before,” she adds. “Percussion instruments are unfortunately not very known ... We want to bring people who love rhythms and beats here, and make this city known for that. Here in Quebec, there aren’t that many who appreciate percussion—it’s not like in some other countries where there are carnivals and such,” says Cadieux. Cadieux was not discouraged however. She continues: “We told ourselves, ‘We’re going to learn from this experience.’ If ever the Hôte Zone returns—we are going to discuss this thoroughly—we will offer tickets that will be much less expensive. We might get more people and it would be worth it for both the performer and the audience. The Leipzig String Quartet began its "Romantic Heroes" concert at the Toronto Summer Music Festival in Koerner Hall on July 28 with Mendelssohn’s Quartet No. 6 in F minor, Op. 80 and Beethoven’s Quartet in F major, Op. 135—the last quartets the composers wrote. 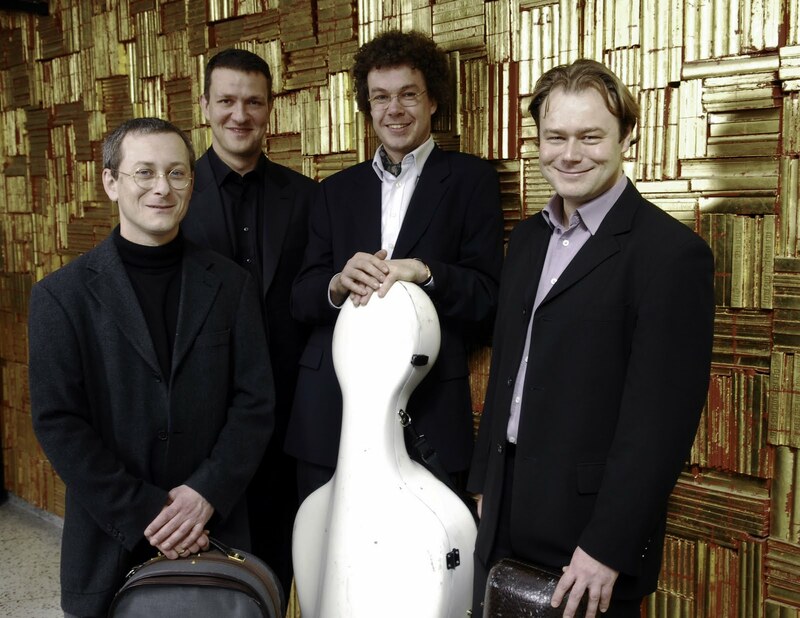 Stefan Arzbuger (first violin), Tilman Buning (second violin), Ivo Bauer (viola) and Matthias Moosdorf (cello) delivered decent performances of both quartets. The Mendelssohn was passionate, to say the least. It had all the right ingredients to be a solemn performance befitting thepiece that the composer created in mourning for his sister Fanny’s death. One of Arzbuger’s strings broke right near the very end, but despite having to pause abruptly for a few minutes, the quartet picked up the music where it left off and the effect was less breathless but sizzling nevertheless. The Beethoven was welcomingly sunny and happy in comparison. It was played with supremely confident skills and subtle but dramatic nuances highlighted the piece throughout. After intermission, Buning, Bauer and Moosdort returned to the stage with pianist Menahem Pressler for a solid performance of Schumann’s Piano Quartet in E-flat major, Op. 47. Pressler still has his chops at 87 years of age. A true chamber musician, he achieved the brisk give and take of the music with the players and was as energetic as ever, without attracting the most attention. In fact, the strings slightly overpowered the pianist at times, but overall it was a sharp reading that saw all players taking risks along the way. Everyone returned to stage for an encore of the second movement of Brahms’ Piano Quintet in F minor, Op. 34—a sweet lullaby bestowed with delectable sweet dreams.